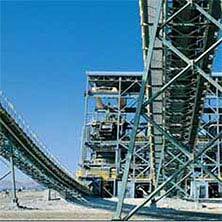 Our company is looked upon as one of the dependable Steel Cord Conveyor Belts Exporters from India. Various national as well as international clients are placing bulk orders for the Fire-Resistant Steel Cord Conveyor Belt due to the unmatched quality and unsurpassable performance in respective applications. Additionally, the Steel-Cord Reinforced Conveyor Belting is available in varied sixes and dimensions as per the specific requirements provided by the clients. Structure :- The belt core is comprised of longitudinally and evenly arranged non-spinning galvanized wire ropes and high adhesive core rubber, with the upper side and lower side covered with rubber layer. Features :- High tensile strength, long service life, short elongation under service, good groove formation property and good anti-flexure property, suitable for conveying materials across long distance, with large volume and high speed. Types :- According to structure: General type, Impact resistance and Rip resistance transverse type. According to application: besides General-used steel cord belt, there are some kinds of Fire-retardant type, Cold-resistant type, Wear-resistant type, Heat-resistant type, Acid and alkaline resistant type, Oil-resistant type, High-grade type and etc. Note : The length of single roll of conveyor belt is 100m-1500m, depending on its thickness, width, transportation and installation conditions. The length shall be determined through discussion of supplier and buyer.